The Ultimate Media Player for MAC or PC: Make DJ Mixes, Scratch Videos and Sing Karaoke Anywhere - Not sure what to get this holiday season- the latest hot new entertainment software, or the coolest Android™ or iPhone™ Karaoke application? Digital 1 Audio, makers of ARIA entertainment software believe the choice is easy – both. ARIA software (ariaparty.com) allows the user, regardless of skill level, to mix and scratch audio and video files, and turn their computer into a complete karaoke system. 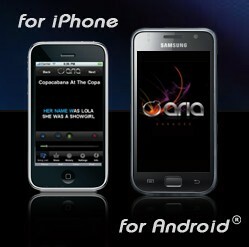 ARIA is also available as a Karaoke only version on both iPhone and Android mobile devices. Digital 1 Audio releases ARIA entertainment software designed to please the DJ and karaoke fan in all of us. ARIA allows you to have a more intimate and interactive experience with your Audio, Video and Karaoke files. With the success of games like DJ Hero 2, Karaoke and Hip-Hop artist console games, ARIA is designed to make it easy for anyone to DJ, mix and scratch both audio and video files on their Mac or PC, and turn any computer into a karaoke system. Everyone loves karaoke, but the process of getting karaoke files has always been difficult. ARIA solves that problem by including the ability to purchase karaoke files directly within the ARIA software, as well as the mobile ARIA Karaoke apps. Now you can easily get any karaoke song you want for your home computer or while on the go with your Android™ or iPhone™ mobile device. The American Idol™ craze has waned a little, but the desire for people to sing their favorite songs for fun, or future star-dom, will never change. ARIA Karaoke for mobile phones is the only complete professional solution when it comes to mobile Karaoke. The sound quality and ease of use make it the only choice in the mobile app marketplaces to get true karaoke performance right in the palm of your hand. Now anyone can practice, sing-a-long and be the star. ARIA’s interface design is not crowded and confusing, it simply works and has the right feature set to make it accessible to users of all ages. The layout of most DJ only applications is quite complicated so ARIA’s focus was always sound quality and ease of use. It does not matter what the software can do, if most people cannot figure out how to use it right away. “I want families getting together and singing Karaoke with ARIA this holiday season, so for a limited time we are offering ARIA at the low introductory price of only $79 and are even including 20 karaoke downloads of your choice, a $30 value at no additional cost.” - states Davidson. * Three modes to choose from, makes it fun for the whole family. Karaoke Mode, DJ Mode and Scratch Mode. * Built in access to purchase karaoke music, simplifies the thing that most karaoke enthusiasts do not like, building a karaoke library! * One click record feature so you can listen to your DJ music mixes or karaoke performances whenever you want. * Plays all the popular audio and video file types: MP3, AAC, Ogg Vorbis, WAV, AVI, MP4, etc. * Easy to read lyrics on screen. * Great sounding karaoke songs. * Built in Karaoke Locker™ access, to select from over 12,000 karaoke song library.